Photos provided by Genevieve Brasfield. Family photographs of Dena Brasfield who died in 2010 of a prescription drug overdose. Family photographs of Dena Brasfield, who died in 2010 of a prescription drug overdose. On Jan. 27, 2010, Dena Kay Brasfield died in her sleep. Two days earlier, the 40-year-old clothing store worker had gone to see Oklahoma City doctor Cecil Allen Moore, complaining of migraines, anxiety and panic attacks. He prescribed her large doses of alprazolam, an addictive anti-anxiety drug, and oxycodone, a potent opiate painkiller. Police determined Brasfield had taken only a few more oxycodone pills than the doctor authorized. They weren’t sure how much alprazolam she took. The medical examiner ruled it an accidental overdose. Nobody reported the death to the Oklahoma Board of Osteopathic Examiners. It wasn’t until late 2011, after receiving complaints about Moore from pharmacists, other patients and relatives, that the board launched an investigation of his prescribing practices. They soon made a gruesome discovery: Eight of Moore’s patients had died of overdoses in 2010 and 2011. Not one had been reported to the board. By the time the board revoked Moore’s license in mid-2012 for prescribing violations, more than two years had passed since Brasfield swallowed her fatal cocktail of prescription drugs. The eight deaths on Moore’s watch, and others like them, expose troubling gaps in the state’s system for combating an epidemic that has seen Oklahoma surge to near the top of national rankings for prescription drug abuse and overdose deaths. In 2012, unintentional prescription drug overdoses claimed the lives of 534 Oklahomans. State health authorities say about half of them had taken drugs prescribed by their own doctors. While much of Oklahoma’s enforcement efforts are aimed at drug-seekers, far less effort is dedicated to identifying, investigating and pursuing the problem providers — the doctors who supply the sometimes deadly dosages. Despite the fact that almost one out of every two overdose deaths involves a drug the person was prescribed legally, state investigators don’t check regularly to see whether the prescriber might be linked to other overdose deaths. In some instances, that allowed problem prescribers to escape detection by regulators and to continue to overprescribe, in some cases for years, leading to additional deaths and injuries, an investigation by The Oklahoman and Oklahoma Watch has found. Doctors such as Joshua Livingston, who saw 60 to 100 patients a day at his South Pointe Pain Clinic in Tulsa. Four of his patients died of overdoses. After the first death in August 2011, 18 months went by before Livingston was placed on probation and his prescribing practices were restricted. Or Dr. Joseph Knight, a Tulsa infectious disease specialist who had nine patients die of overdoses from 2009 to 2011. It wasn’t until March of this year that the medical board heard his case, more than five years after his first patient died. Or Dr. Amar Bhandary, an Oklahoma City psychiatrist, who during 2008 and 2009 wrote prescriptions that resulted in the overdose deaths of five people. It wasn’t until 2013 that the state medical board and prosecutors moved against him. Or Dr. R. Wayne Mosier of Talihina who in 2007 and 2008 had four patients die from lethal overdoses shortly after he prescribed them controlled substances. It wasn’t until 2009 that the narcotics bureau pulled his prescribing license. Had it not been for complaints from the public, their prescribing practices might never have been discovered. Calls for fixing gaps in the monitoring system come at a time when an estimated 5 percent of the state’s residents over age 11 — about 164,000 people — are abusing prescription narcotics, according to a recent federal survey. Oklahoma ranked eighth among the states for nonmedical use of prescription painkillers. In the past 12 years, Oklahoma has seen the overall number of overdose deaths from prescription drugs more than double, and the number of deaths due to hydrocodone and oxycodone more than quadruple. Overdose deaths now surpass motor vehicle crashes as the leading cause of unintentional injury in the state and are the leading cause of death by injury for Oklahomans ages 25 to 64. “Obviously, with the number of deaths we have, we have a problem,” said Dr. Eric Frische, medical adviser to the Oklahoma State Board of Medical Licensure & Supervision. • The medical examiner’s office typically takes two to three months — and even sometimes a year or more — to complete its death investigation reports and turn them over to the state narcotics bureau for review. By the time the drug agency finds out about a fatality, more overprescribing and overdoses have occurred. • The state’s primary tool for tracking narcotics sales — the Prescription Monitoring Program — is underused by enforcement authorities and many prescribers. The narcotics bureau does not mine the program data routinely to target overprescribers, relying instead on tips and complaints to initiate almost all cases. Many physicians do not check the program regularly to prevent “doctor-shoppers” from obtaining multiple prescriptions for dangerous drugs. • State agencies and licensing boards do not regularly share with each other information about overprescribing and patient deaths. The medical examiner typically does not record the names of prescribing physicians when it collects evidence in overdose cases. Neither the medical examiner nor the narcotics agency routinely notify the medical boards of overdose cases they might want to review. And the state’s Medicaid agency does not notify the medical boards if the agency pulls a doctor’s Medicaid license for any reason. • State licensing boards rarely discipline doctors involved in overprescription deaths. Since 2007, only 11 doctors linked to overdose deaths have been subject to disciplinary actions by their licensing boards. • State enforcers say local prosecutors are reluctant to pursue criminal overprescription cases against doctors, saying they are expensive, time-consuming, difficult to litigate and, in some cases, unpopular with the community where the doctor practices. In the past two years, prosecutors have filed criminal charges against just one doctor investigated by the narcotics agency for drug diversion. • Existing state laws hamstring the ability of the narcotics bureau and medical licensing boards from collaborating effectively to detect and deter overprescribing. At the insistence of the medical lobby, all Prescription Monitoring Program data is deemed confidential and its dissemination restricted, making it more difficult for the licensing boards to identify problem prescribers. Some regulators said they were troubled by the findings of the investigation by Oklahoma Watch and The Oklahoman, acknowledging they had not fully recognized the size and scope of the overprescribing problem. Lyle Kelsey, executive director of the Oklahoma State Board of Medical Licensure & Supervision, said he planned to more aggressively pursue problem doctors in response to the findings shared with him by reporters. “We are not going to educate prescribers out of this deadly epidemic. I need … investigators with keen knowledge of the drug problems. I also need more prosecutors to keep things moving toward proper discipline,” Kelsey said. On March 6, Kelsey won approval from the medical board to hire three additional staff members to help investigate and prosecute prescription drug cases. After an overdose death, authorities gather a wealth of information, including the person’s medical history and, when available, a list of any prescription drugs the person may have been taking. Unlike their counterparts in some states, Oklahoma medical examiners don’t routinely collect the names of the doctors who prescribed the drugs, saying it’s not their responsibility. Nor does the medical examiner’s office alert the prescribing doctors or their medical licensing boards that a patient has died. “We stay away from quality-of-care issues,” medical examiner’s office spokeswoman Amy Elliott explained. Dr. Hal Vorse, an Oklahoma City addiction treatment specialist, said he finds that hard to understand. 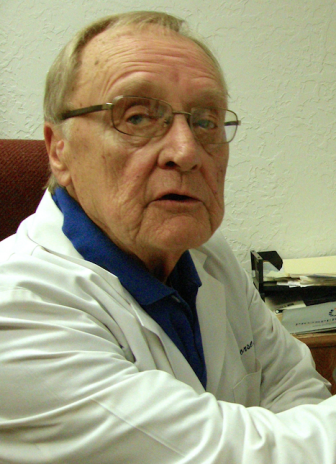 Dr. Hal Vorse, an Oklahoma City physician who specializes in drug addiction. 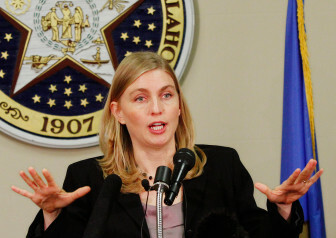 By failing to collect or report the prescriber’s name, the medical examiner omits key evidence that could delay any investigation into whether the prescriber may be linked to other overdoses.Other public health crises, such as Oklahoma’s recent influenza outbreak, are monitored far more closely, said Vorse, who oversees three drug and alcohol treatment facilities and teaches addiction medicine at the University of Oklahoma Health Sciences Center. “Every week we get a report of how many deaths were due to influenza since this outbreak started,” he said. “We know every week who’s dying. Why can’t we get that same data on overdose deaths? There’s 10 times as many people dying from overdoses than dying from influenza.Kelsey, the head of the state medical licensing board, said collecting and forwarding such information could be helpful in more quickly identifying problem prescribers. Eventually, the medical examiner forwards a death investigation report to the state narcotics bureau.But because of a massive backlog in completing the investigations, it generally takes months before the report is submitted. An analysis by Oklahoma Watch and The Oklahoman of more than 2,000 overdose deaths shows that, on average, 105 days elapsed between an overdose death and the completion of the report. In 30 cases, it took more than a year to finish the report. The longest time lag was 653 days. That makes a timely analysis of the death impossible. Earlier this year, the narcotics agency said it was still receiving reports from the medical examiner involving overdoses in 2011. Even when it receives an overdose death report, the bureau does not routinely seek to link any prescribed drug found in the person’s system with the doctor who provided it. Nor does the agency make any attempt to link the prescriber with any previous overdose deaths, saying that’s a quality-of-care issue and the responsibility of the various licensing boards. “We don’t tell doctors how to practice medicine,” bureau spokesman Mark Woodward said. Neither the narcotics bureau, the medical examiner’s office, nor local law enforcement authorities routinely report the names of doctors connected to overdose deaths to the licensing boards to review for potential overprescribing. At this juncture, we will not know that until somebody is dead and their family member has reported it, and that’s a little late in the game,” said Bruce, head of the state’s Board of Osteopathic Examiners. The narcotics bureau also doesn’t forward its reports on high-volume prescribers and patients to the state’s medical licensing boards so they can intervene quickly with the physicians they oversee. Even in cases where the narcotics bureau or the U.S. Drug Enforcement Agency suspends or revokes a doctor’s right to prescribe, neither agency notifies the medical provider’s licensing board of the action. Terri White, mental health and substance abuse services commissioner. Terri White, the state’s mental health commissioner, said she thought it was critical for data to be shared regarding prescription drug overdoses. “We’re supportive of anything that increases the use of data in decision making, particularly in terms of treatment,” said White, who also oversees the state’s substance abuse services. 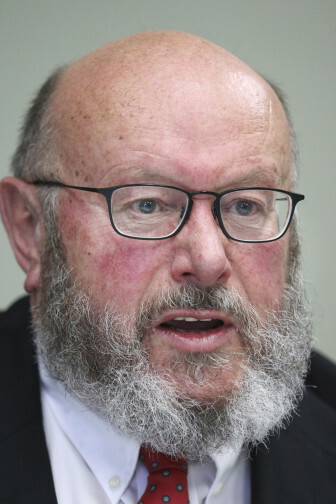 Vorse, the addiction specialist, agreed, saying the investigation’s findings highlighted the need for better information sharing among the various agencies, licensing boards and prescribers, who in many cases may not even know their patient is dead. In a profession where the most important principle is do no harm, doctors need to be aware when their patients die of an overdose, he said. “A lot of these doctors may not realize that they’re the outliers,” Vorse said. For the past eight years, most Oklahoma pharmacists have been logging every narcotic prescription they fill into an online database called the Prescription Monitoring Program, or PMP. For the past two years, they have been required to do so within five minutes of filling the scrip. Mary Jane Fry, a pharmacist at Medic Pharmacy at Hefner Pointe, has seen an increase in the number of people calling and asking specific questions about the drugs they want. That’s usually a red flag. 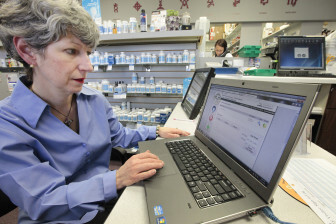 Mary Jane Fry of Medic Pharmacy in Oklahoma City enters information in Oklahoma's Prescription Monitoring Program. “If somebody calls us up and asks if we have a drug, and then they show up 30 minutes later, and it’s from another part of town, then we’re more suspicious, and that’s when we would use the PMP,” Fry said. All in-state medical providers licensed to prescribe controlled dangerous substances in Oklahoma have access to the monitoring program data. It only takes a minute or two to log on to the system and check a patient’s prescribing history to make sure he or she isn’t getting simultaneous prescriptions from several physicians, a practice known as doctor-shopping. State authorities say Oklahoma’s real-time monitoring program information is one of the best in the nation.But it only works well if people bother to use it. And many doctors don’t. Last year, Oklahoma pharmacies filled 9.7 million prescriptions for controlled dangerous substances. The biggest seller by far was hydrocodone — enough doses of the potent painkiller to give every man, woman and child in the state 50 pills apiece. Yet Oklahoma medical doctors, physician assistants and other licensed prescribers logged into the Prescription Monitoring Program only 1.2 million times last year. Even allowing for the fact that one log-in might cover two or three prescriptions, that still suggests that most doctors aren’t using the system routinely to make sure their patients aren’t doctor-shopping. Lea Gray is a recovering prescription drug addict who now works at a Hollis hospital. Lea Gray, a recovering addict in Hollis, said she was simultaneously filling hydrocodone prescriptions written by four doctors. None of them detected her doctor-shopping because none of them bothered to check the monitoring program, she said. It’s been several years since Gray gave up her hydrocodone habit, but she said she thinks the monitoring program is still underused by prescribers. Under existing law, Oklahoma doctors are not required to check the PMP when they write narcotics prescriptions. When attempts have been made to make PMP use mandatory, their professional associations have lobbied successfully to keep that from happening. Most doctors know their patients, the associations argued, and mandatory checks would take too much time. “That was, from a clerical and time standpoint, completely unworkable for a physician’s office,” said Wes Glinsmann, director of state legislation and political affairs for the Oklahoma State Medical Association. This year, Gov. Mary Fallin has thrown her support behind legislation that would require PMP checks for every narcotic prescription, and it appears that the physician groups might agree to at least some degree of mandatory participation. “We want them, every single time they prescribe … to look,” said the bill’s author, Sen. A.J. Griffin, R-Guthrie. Dr. Charles Shaw, who specializes in addiction medicine, said he runs a PMP check on each of his patients at least every three months, and wishes other doctors would do the same. Not only do many doctors fail to use the PMP, the narcotics bureau does not routinely share with other enforcement agencies its periodic tallies of the highest-prescribing physicians and the biggest-volume patients. In some cases, the numbers are eye-popping. During a three-month period in 2012, Dr. William Valuck wrote an average of 115 prescriptions for controlled drugs every work day at his southwest Oklahoma City clinic. Valuck’s patients used 215 pharmacies in 50 cities to fill his prescriptions. The narcotics bureau said Valuck was “by far” the state’s top prescriber of controlled dangerous substances in 2013, writing 12,000 more narcotics prescriptions than the second-largest dispenser. In 2012, he was writing narcotics prescriptions at a rate of nearly 30,000 a year. Even so, the bureau contends that circulating its roster of big prescribers might unfairly cast aspersions on pain doctors and other physicians who are writing large numbers of narcotic prescriptions for legitimate reasons. 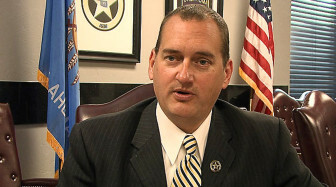 Mark Woodward, of the Oklahoma Bureau of Narcotics and Dangerous Drugs. “As far as a top-prescribers list, absolutely not. Because that’s just a scarlet letter on some doctor who may not be doing anything wrong, who just sees a lot of patients,” said narcotics bureau spokesman Woodward. But the licensing board directors said they have the ability to distinguish legitimate practitioners from flagrant over-prescribers. If they were reviewing those rosters on a regular basis, they might be able to intervene with the outliers before disaster strikes, they said. Providing the list might have helped them spot Valuck. In December, he was charged with nine counts of murder after eight of his patients died of drug overdoses and a ninth was accused of causing a fatal traffic accident. A review of disciplinary records shows that the state’s two largest licensing boards rarely discipline doctors as a result of overdose deaths. Despite at least 300 people now dying each year from drugs their doctors prescribed them, and nearly three times as many suffering nonfatal overdoses, the state’s two physician licensing boards have sanctioned just 11 doctors since 2007 for over-prescribing that led to deaths. Even in those cases, the boards didn’t know patient deaths had occurred until they were well into their investigations. The discipline in most cases amounted to the doctor’s license being surrendered, revoked or suspended, in some cases for a year or less. Others were put on probation, sometimes with restricted prescribing ability. Among the 11 doctors with patient deaths, four are still practicing in Oklahoma. For narcotics agents, building the administrative case required to pull a problem prescriber’s license is complicated, bureau officials said. Officials say they have to be careful about moving against a doctor based on allegations that can’t be supported by evidence. Manpower is also an issue. Pursuing problem prescribers is just one of the Oklahoma Bureau of Narcotics and Dangerous Drugs’ many responsibilities. The agency’s 90 agents also are charged with combating human trafficking, monitoring the state’s pharmacies and providing investigative support to the state’s 77 sheriffs and hundreds of police departments. In many jurisdictions, the bureau serves as the only drug enforcement agency. About 15 agents are assigned to work drug diversion cases. “We have barely the manpower to focus out there,” said Darrell Weaver, the agency’s director. Criminal cases against over-prescribers are even rarer. LaVenue and Weaver both mentioned that prosecutors are reluctant to pursue cases against doctors. LaVenue said bureau agents “shopped” cases to state and federal prosecutors to “test the waters to see if a district attorney is interested in filing a particular case.” In the last two years, only one case that was forwarded by the bureau to a district attorney — William Valuck — resulted in criminal charges being filed. Other cases have been submitted, but no action has been taken by prosecutors, she said. “Just because an attorney doesn’t bring a case doesn’t mean they don’t want to,” LaVenue said. “It may come down to they don’t have money, or this guy is a pillar of the community and you’re not going to get an impartial jury. People want to trust doctors. LaVenue cited the case of Dr. Bhandary, the Oklahoma City psychiatrist who had five patients die from prescription overdoses. In 2012, a federal grand jury charged Bhandary in a 53-count indictment. He faced up to life in prison for each of the five counts of illegal distribution of controlled substances that resulted in the deaths. In addition, he faced up to 20 years in prison on each of the other 48 counts of illegal distribution of controlled substances. To LaVenue, it seemed like a slam dunk case of over-prescribing. Despite solid evidence, convincing witnesses, dramatic testimony and a defendant who at one point fled the country, the trial ended with a hung jury. Bhandary later pleaded guilty, but to health care fraud. He was sentenced to 30 months in prison, fined $20,000 and ordered to pay restitution and forfeit commercial property. Chris Ross, president-elect for the Oklahoma District Attorneys Council, agreed. “What I have to prove is: he knowingly prescribed them to somebody who didn’t need them or he prescribed them too much,” Ross said. Some defend the doctors, saying it’s wrong to blame prescribers for the bad behavior of some patients or make them assume primary responsibility for preventing overdoses from occurring. Bruce said, in her experience, even the most extreme over-prescribers who are disciplined by her board seem to feel genuine remorse when fatal overdoses occur. “They don’t always think they’re responsible for the death, but they do regret it very much that the patient died on their watch,” Bruce said. Dr. Jorg Paul, an Oklahoma City psychiatrist. Dr. Jorg Pahl, an Oklahoma City psychiatrist who specializes in neurology and internal medicine, said he fears that the threat of criminal prosecution will cause many pain specialists to stop providing compassionate treatment to people who need it. He said he already has reduced his pain management practice by at least 70 percent. Health care attorney Daniel Gamino said there should be a mechanism to allow a neutral review of patient deaths — not in a criminal setting and not in a professional licensure setting, but rather in a doctor-to-doctor peer-reviewed setting. Medical Association Executive Director Ken King noted that some prescription drug overdose victims did not obtain their narcotics from the doctor who originally prescribed them. Dena Kay Brasfield’s death in January 2010 went largely unnoticed. It took weeks for the medical examiner’s office to finish its report, and it didn’t send a copy to the osteopathic board. Over the next 19 months, seven more of Moore’s patients died from overdoses of drugs he had prescribed them. The second occurred in September 2010 and the last in August 2011. Those deaths were not reported to the board either. The board opened a file on Moore in 2010 after a woman called to say he was over-medicating her sister. But it didn’t begin investigating him in earnest until early 2012, after receiving other complaints and learning that he was still prescribing narcotics after letting his license lapse. When it sequestered Moore’s patient files, it discovered the eight deaths. Bruce, the board’s executive director, said she cannot say with certainty that no additional deaths would have occurred if the board had been notified of Brasfield’s overdose shortly after it occurred and launched its investigation sooner. But it’s possible, she said. “I can’t tell you that these people would still be alive if the medical examiner had notified us. But it would have been a 2010 case or a 2011 case instead of a 2012 case,” Bruce said. And the deaths continue, at a rate of nearly two Oklahomans per day. Phillip O’Connor is enterprise editor for The Oklahoman, and Jaclyn Cosgrove is health reporter for the Oklahoman. Warren Vieth is reporter and associate editor for Oklahoma Watch. Genevieve Brasfield, 75, recalls her final hours with Dena Kay Brasfield, who died in 2010 after an Oklahoma City pain doctor upped her dosages of two powerful narcotic drugs.